No reliable estimate of beaver populations within the lower Coos watershed exists. Some researchers indicate beaver populations statewide are healthy, while others suggest beavers are declining in parts of Oregon. 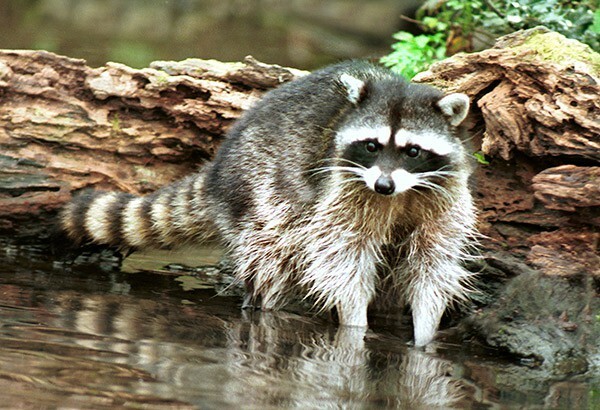 Raccoons are abundant and important terrestrial predators in intertidal habitats. However, little is known about the status and trends of raccoon populations in the lower Coos watershed. In fall 2004, several large west fork Winchester Creek beaver dams were breached by ODFW during an extended period of low flows to accommodate returning Coho salmon adults; with such low stream levels, the dams created uncrossable barriers, and the salmon only have one reach in the Winchester Creek system within which to spawn. Fisheries biologists and land managers have great interest in beaver ponds and pools and their associated influences on the surrounding habitat. 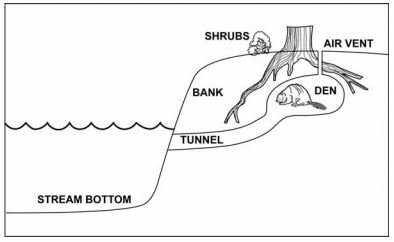 These beaver-mediated habitats are discussed in the Background section of this data summary and in Chapter 11: Stream Habitat, Chapter 12: Vegetation, and Chapter 13: Fish. Because information about the ecology, movements, and dispersal of the American beaver is lacking, it’s not surprising that the overall status of beavers is relatively unconfirmed (Hiller 2011). Some researchers indicate that beavers are generally “doing well” in Oregon (Hiller 2011, Oregon Conservation Strategy 2011). Others estimate that beavers have declined in parts of the state (especially in southeastern Oregon)(ODFW 2006, Nordholm and Miller 2008). From 1998-2003, the Oregon Department of Fish and Wildlife recorded beaver pool presence in salmon bearing streams of coastal Oregon (ODFW 2004)(Figure 1). Their data averaged over five years indicate that beavers inhabited approximately 17% of all salmon bearing streams in the Oregon Coast Coho Evolutionarily Significant Unit (ESU), with more beaver pools occurring in streams on the north coast (22%) and mid-coast (20%) than in either the Umpqua (4%) or mid-south coast (15%) Gene Conservation Groups (CGCs)(Figure 1). No abundance trend over time is immediately apparent from these data (Figure 2). It should be noted that these data clearly understate beaver presence in the lower watershed, because only pools occurring in salmon bearing streams were counted as part of the ODFW survey effort. In addition, comparisons between watersheds may be misleading due to differences in habitat/topography that influence beaver population numbers, distribution, and behavior. What little information we have about beavers in the lower Coos watershed comes from the South Slough Subsystem. 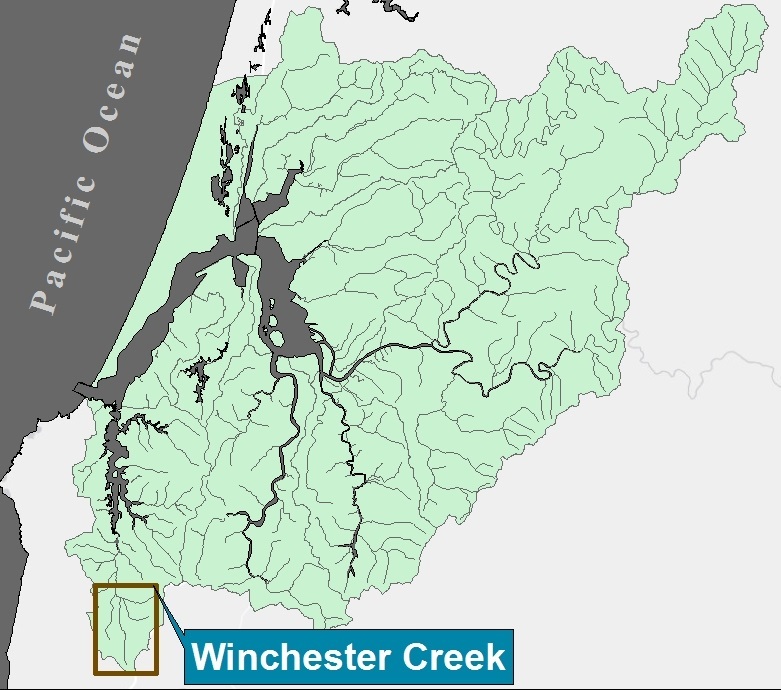 Nordholm and Miller (2008) conducted a survey to “document the distribution of beaver activity and quantify beaver pool habitat” in South Slough’s Winchester Creek drainage. Their data reveal that numerous beaver dams occur in clusters in all tributaries of Winchester Creek (Figure 3 and Table 1). They add that “the presence of beaver-dammed pool habitat… provides a significant portion of total fish habitat in some reaches [of Winchester Creek]” (see Background)(Nordholm and Miller 2008). In addition to mapping beaver dam locations and measuring the extent of beaver-dammed pool habitat, Nordholm and Miller were also able to compare their data with information from previously conducted surveys to estimate how the distribution of beaver dams on Winchester Creek has changed from 1999-2008. They concluded that the number of large perennial dams in the upper headwaters of the Middle fork has increased, while composition of dams on the West Fork has shifted to include fewer perennial dams and a greater number of smaller, ephemeral dams. 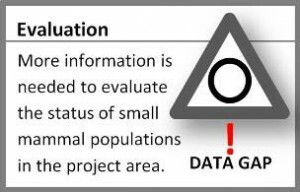 There are no data currently available that characterize raccoon populations in the project area. Through anecdotal observations, wildlife managers know that raccoons are locally abundant and that they are likely important predators in intertidal habitats within the lower Coos estuary. 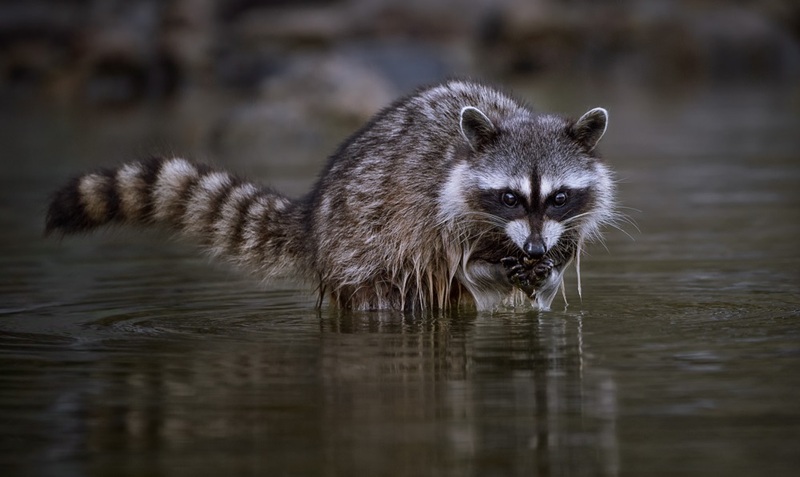 Research shows that raccoons forage in tidal wetlands (mudflats, marshes) for a variety of prey species, including crabs, oysters, clams, and segmented worms (Tyson 1950, Ivey 1948, Warrick and Wilcox 1981, Arbuckle 1982)(Figure 4). By studying intertidal animal communities, researchers have shown how predators influence the distribution and density of prey species, as well as the competitive interactions among intertidal organisms (Paine 1966, 1969; Peterson 1982; Summerson and Peterson 1984). Raccoons, as intertidal predators, likely influence the intertidal animal communities with which they interact, and yet raccoon populations are still not well studied. The information we do have about raccoons on Coos estuary tidal flats is based on an observational behavior study of raccoons in coastal habitats. Not surprisingly, Davidson (1990) concluded that local raccoons forage on a variety of intertidal organisms, including crabs, sea urchins, bivalves (i.e., clams, oysters, and mussels), as well as fruits, insects, and small fish. She adds that, although raccoons appear to be accustomed to human disturbance (e.g., spotlighting), their behavior is a function of their environment. Most notably, raccoons on tide flats near human development (e.g., Glasgow) tend to be nocturnal foragers, while raccoons in low-development areas (e.g., South Slough Subsystem) extend their foraging period into the daylight hours. The American beaver is the largest rodent in North America, and although beavers are most closely associated with mountain and coastal forest habitat, they occur extensively throughout Oregon anywhere were there is permanent water (Figure 5)(Csuti et al. 1997, ODFW n.d.). Beavers are often associated with their characteristic incisor teeth, which grow continuously and must be maintained by tree cutting and feeding on the outer bark of trees as well as grasses, forbs, and aquatic vegetation (ODFW n.d., Cramer 2010). Due to the high value and cultural significance of their pelts in the Pacific Northwest, beaver harvesting was historically common (see sidebar). Beavers are considered “ecosystem engineers,” because they effectively “manufacture” habitat by impounding (damming) water using immediately available materials, including wood, stones, mud, and plant parts (Jones et al. 1996, Wright et al. 2002, Lawton and Jones 1995, Cramer 2010, ODFW n.d.)(Figure 6). 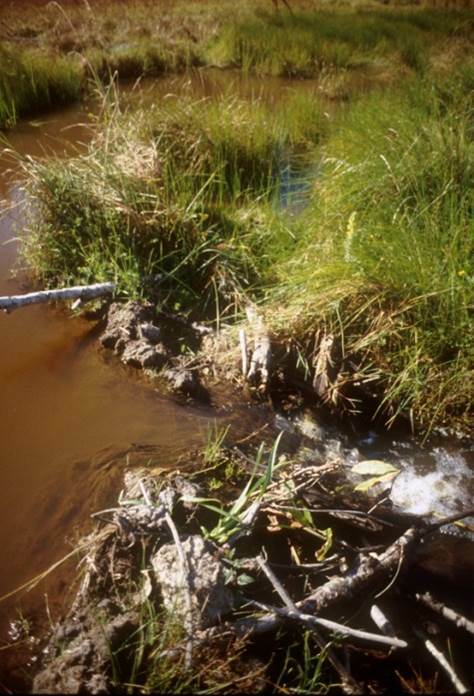 Beaver dams change the hydrology of the streams in which they live, often creating deep pools that provide protection from predators as well as easy access to both food resources and entrances to their dens (Cramer 2010, ODFW n.d.)(Figure 7). Due to their tendency to modify the hydrology of the landscape around them (Fouty 2003), beavers have been the source of some controversy. The construction of beavers dams in sensitive areas (e.g., agricultural land, urban development, and near important infrastructure) can compromise the integrity of culverts, roads, septic systems, and other infrastructure, as well as impede the productive use of land (Cramer 2010, ODFW n.d.). 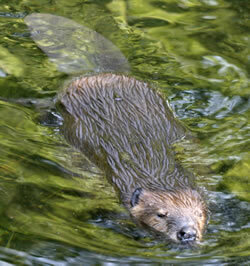 But landowners may also benefit from beaver activity, which can reduce channel scouring and bank erosion, promote vegetation that helps bank stabilization, improve water quality by trapping silt and removing toxic chemicals, and create a number of recreational and aesthetic values associated with wetland areas (ODFW n.d., Needham and Morzillo 2011). In 2011, ODFW conducted a survey to assess public opinion about beaver activity on private land across the state (Needham and Morzillo 2011). Of the 411 respondents in coastal Oregon, about one third (30%) of landowners indicated that they have experienced impacts (i.e., damage to their property or neighboring properties) from beaver activity on their land. 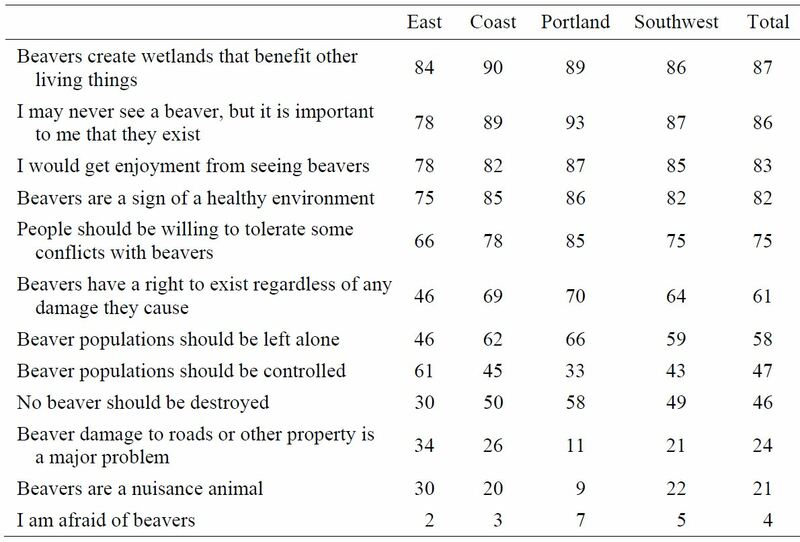 Despite these damages, very few landowners (20% in coastal Oregon) felt that beavers are a nuisance, most (62%) agreed that “beaver populations should be left alone,” and a strong majority (85%) believed that “beavers are a sign of a healthy environment” (Table 2). Figure 8. Range map showing the extent of raccoon habitat (purple) in Oregon. Figure: Csuti et al. 1997. Figure 6. A beaver dam on Cox Creek in the South Slough Subsystem illustrates the beaver’s ability to use a variety of materials to impound water. The practice of relocating beavers from sensitive areas to more suitable habitat was publicly adopted in Oregon as early as 1932 (Hiller 2011). More recently, management agencies have begun purposefully relocating beavers to improve habitat quality for the federally listed coastal Coho salmon (Orcorhynchus kisutch). Research has documented juvenile Coho using beaver ponds in the South Slough Subsystem as overwintering habitat (Miller and Sadro 2003), and many believe that beaver activity may improve fish production while promoting overall habitat complexity (Leidhold-Bruner et al. 1992, Snodgrass and Meffe 1998, Collen and Gibson 2001, Kemp et al. 2012, Hiller 2011, Cramer 2010, Duke 1982). Despite encouraging prospects, there is some evidence to suggest that the relocation of beavers for salmon habitat enhancement may not be an effective strategy, because it may result in low beaver survival and limited salmonid habitat development (dam production tended to be limited and ephemeral)(Petro et al. 2015, Rodgers et al. 1987). Raccoons are versatile omnivores, meaning that they live in a broad range of habitats and have diverse diet preferences including both plants and animals (Csuti et al. 1997, Audubon n.d.). Raccoons occur almost ubiquitously throughout western Oregon and into the eastern half of the state as well, where they are restricted to canyons and river basins that hold permanent water (Figure 8)(Csuti et al. 1997). Raccoons are well adapted to live in urban and suburban habitats, where a lack of predators and access to reliable food sources (e.g., trash cans, compost bins, pet food bowls) allow raccoons to proliferate (Audubon n.d.). Figure 7. Beavers often construct occupy dens, which are often dug into the side of a stream bank and provide access to habitat via an underwater opening. Dens provide shelter and serve as a nursery for their young. Figure: ODFW n.d. The effectiveness of beaver survey methods limits our ability to generate a reliable population estimate for the project area. Although traditional methods (i.e., live trapping) are somewhat reliable, they are costly and labor intensive (Swafford et al. 2003, Cramer 2010). The efficacy of other monitoring methods (e.g., camera trapping and visual inspection of food caches, scent mounds, or cuttings) is questionable at best (Swafford et al. 2003, Baker and Cade 1995, Cramer 2010). The use of computer modeling to predict the distribution of European beavers (Castor fiber) has been somewhat successful in Austria (Maringer and Slotta-Bachmayr 2006). However, a number of factors (e.g., habitat abundance and behavioral diversity) may limit the ability to apply these models to American beaver populations in Pacific Northwest estuaries (Cramer 2010). A more complete understanding of the behavior of beavers in the Pacific Northwest in also lacking. Cramer (2010) explains that most beaver research focuses on northern latitudes (e.g., northern Canada), where climate-dependent behaviors such as lodge building are common. She adds that, although beaver behavior on the Pacific Northwest coast is distinct from individuals in northern Canada, relatively little research has been completed on beavers in these habitats. Raccoons are “opportunistic feeders,” meaning their diets are highly variable with preference given to food sources that are most easily accessible (Kaufmann 1982). Davidson (1990) has documented this behavior in the Coos estuary by demonstrating a statistically significant (P < 0.01) preference for large (> 30mm) soft-shelled clams (Mya arenaria) taken from the highest zone of the intertidal flats. She hypothesizes that these clams are most readily available, because the higher elevation mudflats are devoid of seagrasses, which act as an impediment to raccoon foraging. The unregulated trapping of beavers in the Pacific Northwest began in response to European market demands as early as the 16th century. With the exception of settlement on the east coast of North America, these trapping efforts predate all other Euro-American activities. The heavy beaver harvest led to a substantial reduction in beaver numbers over time. Researchers estimate the population of American beavers dropped from 60-400 million in the early 1600’s to only 6-12 million by 1980. Beaver trapping in Oregon was regulated as early as 1893, when trapping beavers was prohibited in eastern Oregon’s Baker and Malheur Counties. Since then, beaver harvest regulations have changed intermittently, with periods of both stringent and liberal regulation throughout the 20th century. Beaver harvest is currently permitted in Coos County, but is subject to a number of regulations, which are outlined by Oregon Department of Fish and Widlife’s Furbearer Trapping and Hunting Regulations. Source: Phillips 1961; Cronon 1983; Warren 1927; Naiman et al. 1986, 1988; Hiller 2011. Arbuckle, Jane. 1982. The Soft-Shelled Clame and its Environment: a Study in Jonesboro, Maine. [Technical report by the Maine Sea Grant Marine Advisory Program] Orono, Maine. University of Maine. Baker, B.W. and B.S. Cade. 1995. Predicting Biomass of Beaver Food from Willow Stem Diameters. Journal of Range Management. 48: 322-326. Collen, P. and R. J. Gibson. 2001. The general ecology of beavers (Castor spp. ), as related to their influence on stream ecosystems and riparian habitats, and the subsequent effects on fish: a review. Reviews in Fish Biology and Fisheries. 10: 439–461. Constable, R. J. Jr. and E. Suring. 2013. 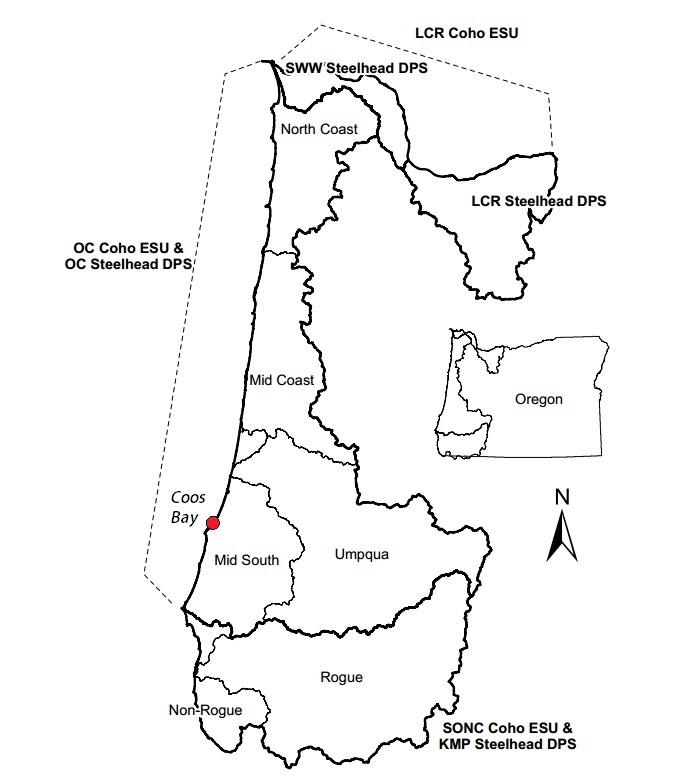 Abundance Monitoring of Juvenile Salmonids in Coastal Oregon and Lower Columbia Streams, 2012. Monitoring Program Report Number OPSW-ODFW-2011-1, Oregon Department of Fish and Wildlife, Salem. Cronon, W. 1983. Changes in the Land—Indians, Colonists, and the Ecology of New England. New Yroke, Hill and Wang. Fouty, Suzanne C. 2003. Current and Historic Stream Channel Response to Changes in Cattle and Elk Grazing Pressure and Beaver Activity. Doctoral Thesis. Department of Geography, University of Oregon. Henschel, P. and J. Ray. 2003. Leopards in African Rainforests: Survey and Monitoring Techniques. Wildlife Conservation Society, New York, NY. Ivey, R. DeWitt. 1948. The Raccoon in the Salt Marshes of Northeastern Florida. Journal of Mammalogy. 29(3): 290-291. Karanth, K.U., and J.D. Nichols. 1998. Estimation of tiger densities in India using photographic capture and recaptures. Ecology. 79: 2852-2862. Maringer, A. and L. Slotta-Bachmayr. 2006. A GIS-based Habitat-suitability Model as a Tool for the Management of Beavers Castor fiber. Acta Theriologica. 51: 373-382. Miller, Bruce A. and Steve Sadro. 2003. Residence Time and Seasonal Movements of Juvenile Coho Salmon in the Ecotone and Lower Estuary of Winchester Creek, South Slough, Oregon. Transactions of the American Fisheries Society. 132: 3, 546-559. Naiman, R.J., J.M. Melillo, and J.E. Hobie. 1986. Ecosystem Alteration of Boreal Forest Streams by Beaver (Castor canadensis). Ecology. 67: 1254-1269. Naiman, R. J., C. A. Johnston, and J. C. Kelley. 1988. 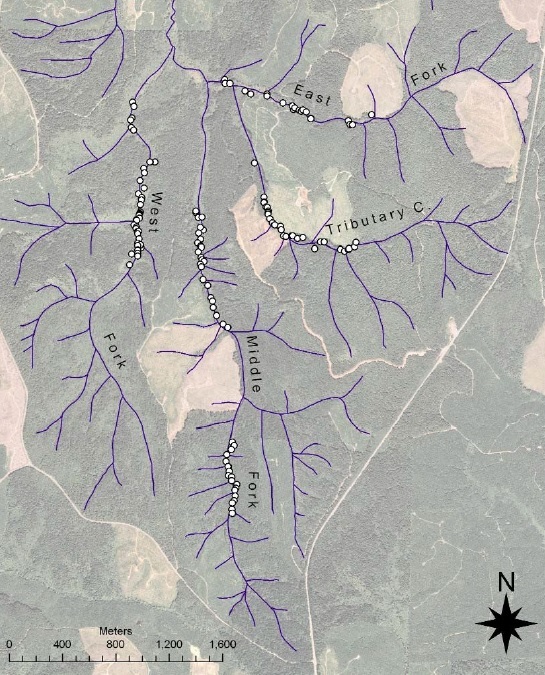 Alteration of North American streams by beaver. BioScience, 753-762. Needham, M. D. and A. T. Morzillo. 2011. Landowner incentives and tolerances for managing beaver impacts in Oregon. Final project report for Oregon Department of Fish and Wildlife (ODFW) and Oregon Watershed Enhancement Board (OWEB). 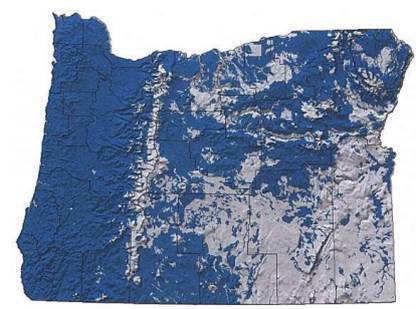 Corvallis, OR: Oregon State University, Department of Forest Ecosystems and Society. Oregon Department of Fish and Wildlife (ODFW). 2006. 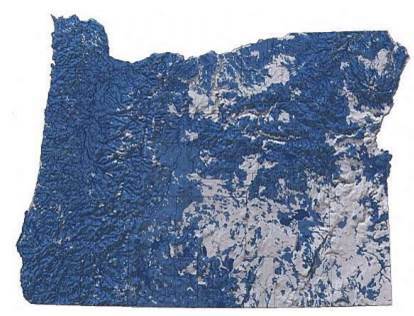 Oregon Conservation Strategy. Oregon Department of Fish and Wildlife, Salem, Oregon. Paine, Robert. 1966. Food Web Complexity and Species Diversity. American Naturalist. 100: 65-75. Paine, Robert. 1969. The Pisaster-Tegula Interactions: Prey Patches. Ecology. 50(6): 950-961. Peterson, C. H. 1982. Clam Predation by Whelks (Busycon spp. ): Experimental Tests of the Importance of Prey Size, Prey Density, and Seagrass Cover. Marine Biology 66:159-170. Petro, V. M., J. D. Taylor, and D. M. Sanchez. 2015. Evaluating landowner-based beaver relocation as a tool to restore salmon habitat. Global Ecology and Conservation. 3: 447-486. Phillips, P.C. 1961. The Fur Trade. Norman. University of Oklahoma. Rodgers, J. D., R. D. Ewing, and J. D. Hall. 1987. Physiological changes during seaward migration of wild juvenile coho salmon (Oncorhynchus kisutch). Canadian Journal of Fisheries and Aquatic Sciences. 44:452–457. Rowcliffe, J. M., J. Field, S. T. Turvey, and C. Carbone. 2008. Estimating animal density using camera traps without the need for individual recognition. Journal of Applied Ecology. 45: 1228-1236. Summerson, H. C. and C. H. Peterson. 1984. Role of Predation Organizing Benthic Communities of a Temperate-zone Seagrass Bed. Marine Ecology Program Series. 15: 63-77. Swafford, S.R., D.L. Nolte, K. Godwin, C.A. Sloan, and J. Jones. 2003. Beaver Population Size Estimation in Mississippi. Wildlife Damage management, Internet Center for USDA National Wildlife Research Center-Staff Publications. University of Nebraska, Lincoln. Tyson, Edwin L. 1950. Summer Food Habits of the Raccoon in Southwest Washington. Journal of Mammalogy. 31(4): 448-449. Warren, E.R. 1927. The Beaver. The Williams and Wilkins Company. Warrick, Sheridan F. and Elizabeth D. Wilcox. 1981. Big River: The Natural History of an Endangered Northern California Estuary. Santa Cruz: Environmental Field Program, University of California.